dailygreenbar is on the road! I started this trip in Ubud, Bali a couple of months ago and after stocking up on greens and fruit at the traditional food markets I went to Seminyak where I made a green smoothie with the hotel kitchen staff! Something interesting I noticed was the fruit salad on the menu for breakfast in Ubud and Seminyak-watermelon, rockmelon and pawpaw…no different than any Western fruit salad. I wondered why they had no other tropical fruit after seeing it for sale on street markets. When I asked what other fruit they had they brought out tiny bananas and sweet fragrant mangos from the kitchen but I drew a blank in both places when I asked about dragonfruit, jackfruit and durian and any other fruit. 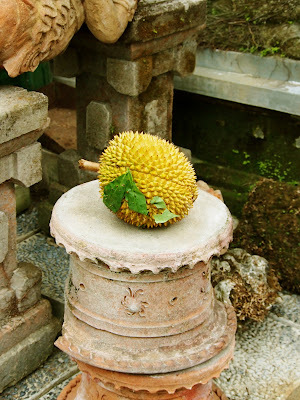 One of the first things that I thought of before going to Bali was durian! I’ve heard so much about this fruit- the smell and the taste-the addictiveness and deliciousness once you get past the pong. The durian is native to Brunei, Indonesia and Malaysia. 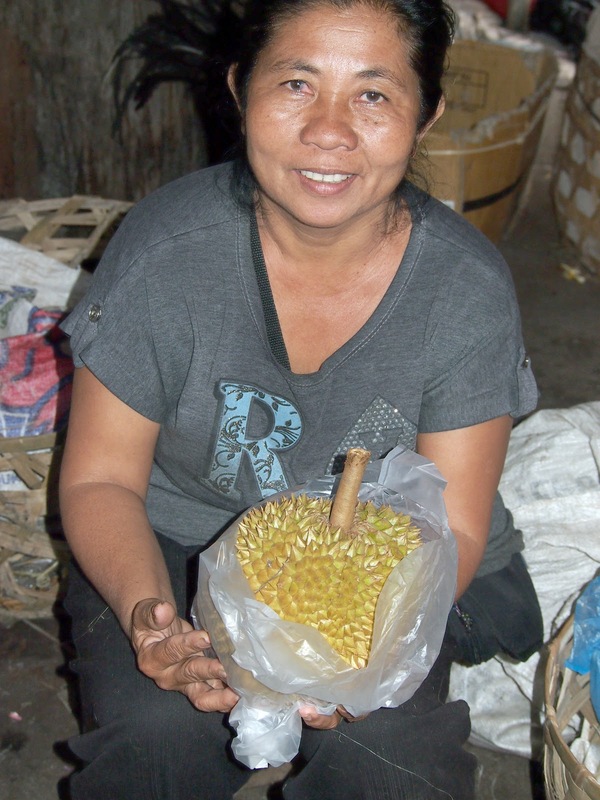 So the sad end to the durian story is…it was decided by someone in Ubud where I was staying that it wasn’t ripe enough to cut up and eat the next morning so it went back in the fridge. The next day I left to go to Seminyak so the durian ended up in a taxi for about an hour with all the greens, other fruit and my bag and it had definitely ripened and had stunk the taxi out by the time it had picked me up half an hour away from Ubud…so the driver stopped at a roadside temple and left my durian here… ok I didn’t get to eat it but it made a great photo. I’ve since read that the smell has led to the fruit’s banishment from some hotels and transport in southeast Asia! 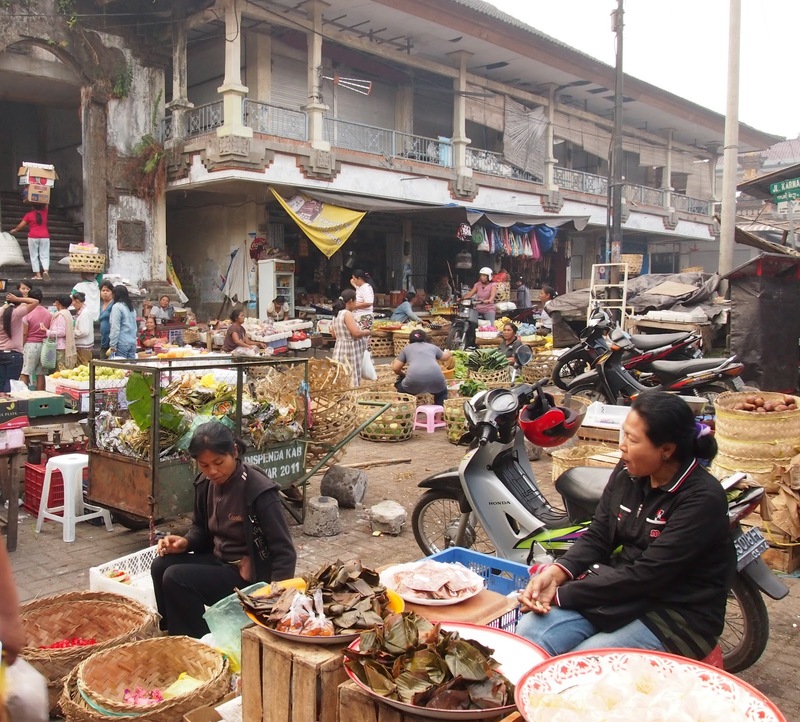 One of the best thing about Bali was all the raw food cafes and restaurants. This was something I didn’t expect at all. I went to the Little K Kafe, K Kafe and Klear Cafe in Ubud. Loved all the fresh vege juices and hot medicinal drinks like ginger lemon and mint served in huge glass mugs. Ayurvedic drinks too, one that had tumeric in it…mmm. 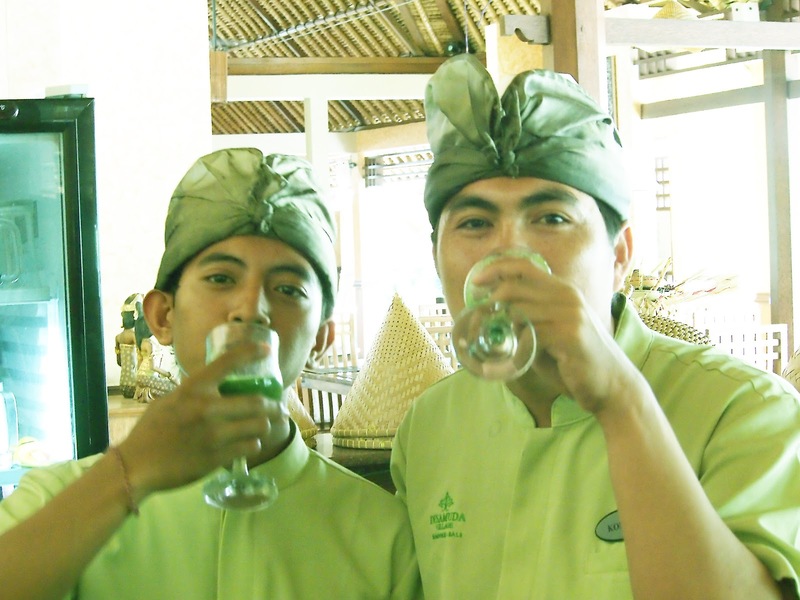 Making the green smoothie in Seminyak was interesting! I have no idea what the greens were I bought but they looked like spinach. We used ginger, lemon, bananas, mango and coconut oil I’d brought with me. The blender wasn’t very good so the texture was a bit lumpy- not my best effort but I think they got the general idea. After making the green smoothie the manager came over to talk and asked if foreigners like smoothies like that. They usually make fruit slushies with ice but can do any type you want. If you are travelling there take some powdered super greens to blend with the hotel fruit and ice. While we were talking I asked him about traditional fruit in Bali. He was actually surprised that people would want Indonesian fruit and not expect a normal Western fruit salad. I think next time overseas I’d take a translator with me to the markets to find out what the greens are and how they are used. Guess I’ll have to look for some durian at markets here! Man, I really like these pictures. That tinge of green is something. I love how vivid the colors of the fruits are.